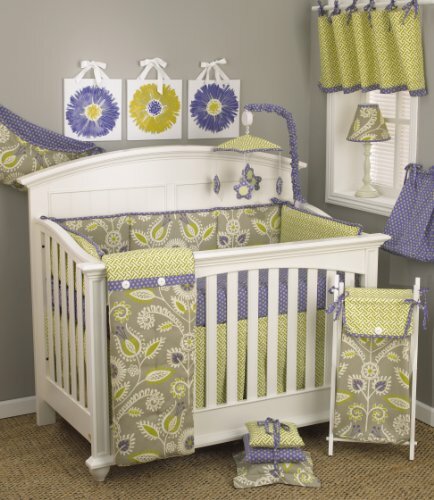 A quality baby bedding set is essential in making your nursery warm and inviting. All Cotton Tale patterns are made using the finest quality materials and are uniquely designed to create an elegant and sophisticated nursery. The periwinkle decor kit includes wall art, standard lamp and mobile. Periwinkle wall are is 3 pieces each measuring 12" x 12". It is hand painted on 1/2" foam board on white canvas and hangs with its ribbon ties or can be framed. The periwinkle lamp in cream resin and shade measures 19" in height. Shade in contemporary floral with periwinkle dot trim measures 8" x 9" x 4". Shade made in the USA. Manufacturer recommends no more than a 40 watt bulb. Spot clean only. Periwinkle musical mobile has star shaped flowers in periwinkle dot dancing around a green lattice canopy with trim and arm cover in periwinkle dot. Wind up mechanism plays brahms lullaby. Basic assembly required, hardware fits most all cribs and for those it does not fit a wall mount is included. Mobiles are not toys and should be removed from crib when baby starts to sit up and pull up. Canopy and pieces 100% cotton. Perfect for little girls.